Presale of What the Heart Knows now available. (New York, NY – August 8, 2011) – Mara Purl completed the first week of her Virtual Book Tour finding new friends and adventures along the way. Purl launches her book, What the Heart Knows, in September 2011 with a Hardcover Edition published by BelleKeep Books in association with Midpoint Trade Books. Purl has visited many of the top Internet venues covering topics as varied as the women who read them. Join the fun, follow the tour. The updated schedule continuing the conversation during the month of August is listed below – and there are many specials for readers including an almost free download (99 cents) on Amazon.com of her Milford-Haven Single entitled When Hummers Dream. Days of Our Lives actress-turned author Mara Purl says the Virtual Book Tour, her first, is challenging, interesting and fun. Some of the blog posts remain up for extended period on the individual sites. Others posts are archived on the blog but all of them will be available on Mara Purl’s site www.MaraPurl.com after the tour. Purl is fast becoming a leader in women’s fiction authors in the U.S. Her book, What the Heart Knows, hits the market in September—as both hardcover and e-book. But, still some may not be familiar with her writing. Enter the Milford-Haven Single with its first short story entitled When Hummers Dream. “What the Heart Knows is the kind of novel you can curl up with while you enjoy getting to know the different people in the central California town of Milford-Haven, as well as getting to know the town itself. 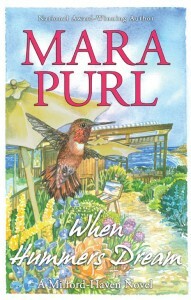 Mara Purl is a skillful storyteller who has written a charming and tantalizing saga about the ways in which lives can intersect and be forever changed. The first novel in the saga, What the Heart Knows, is not-to-be-missed.” – Margaret Coel, New York Times best-selling author of The Wind River Mysteries.